The result is a crispy, salty, slightly sweet crust that makes the perfect foundation for these ooey, gooey bars. Total swoon! After a short bake in the oven, your bars are ready to devour (the best part). For more desserts, check out our Peanut Butter Fudge, Easy Vegan Fudge, Vegan Gluten Free Cinnamon Rolls, Peanut Butter & Jelly Snack Bars, Creamy Vegan Lemon Bars, and Strawberry Rhubarb Crumble Bars! 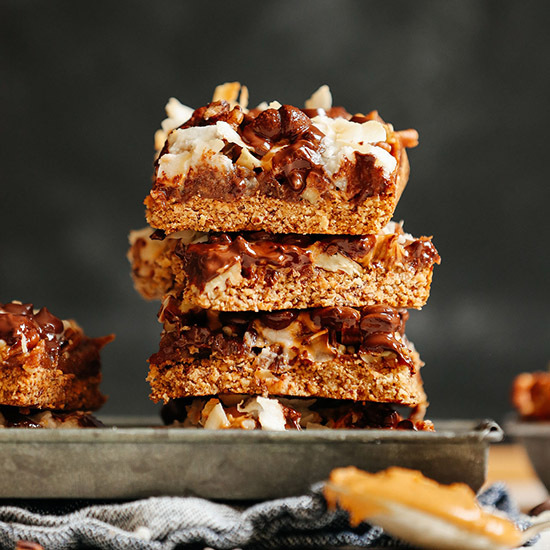 Decadent vegan 7-layer bars with an almond-oat crust, date caramel, coconut butter and flakes, chocolate chips, and peanut butter! Easy to make, gluten-free, and insanely delicious! Prepare crust by preheating oven to 350 degrees F (176 C). Line an 8x8-inch baking dish (or use multiple pans if making a larger batch) with parchment paper and extend paper up over the edges. Add oats, almonds, and sea salt to a high-speed blender or food processor. Pulse into a fine meal. 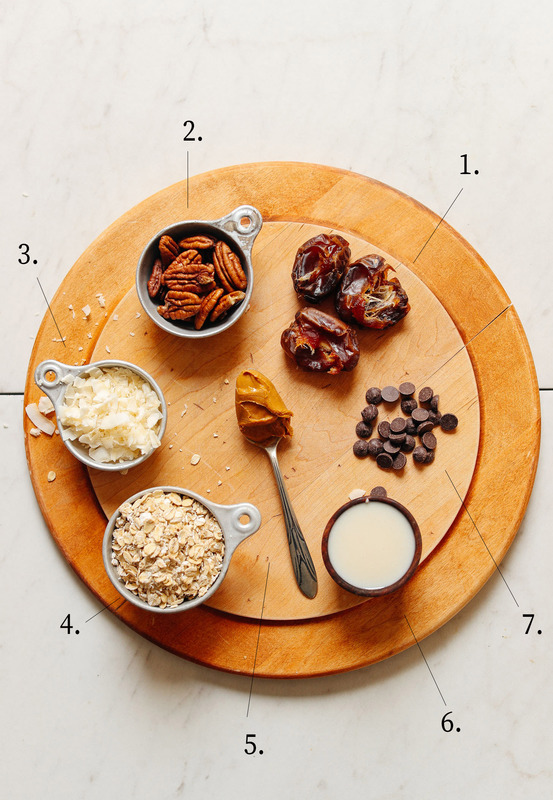 Add maple syrup, dates, and coconut oil and pulse until a "dough" forms that holds together when you squeeze it between your fingers. If it appears too dry, add more dates or water for moisture. Add crust to the parchment-lined pan and use your hands to spread it into an even layer, pushing the crust up to the edges of the pan so it contains the filling well. To achieve a uniform layer, cover a flat-bottom object (such as a drinking glass) with parchment paper and press down firmly. Bake for 12 minutes. Then remove from oven and set aside. In the meantime, prepare date paste by adding dates to a food processor and blending until small bits remain or a ball forms. Then add water 1 Tbsp (15 ml) at a time until a spreadable caramel paste forms. Add a pinch of salt and blend once more. Begin layering: To the crust, add date paste and then pecans, peanut butter, coconut butter, coconut flakes, and lastly chocolate chips. Bake for 10-12 minutes more or until the edges are golden brown and the toppings are slightly toasted. Be careful not to burn the coconut flakes. Remove from oven to cool for at least 20 minutes. Then carefully cut and serve warm. Otherwise, let cool until the chocolate and coconut butter are firm - 6 hours or overnight. To speed cooling time, you can also chill in the freezer or refrigerator. Store leftovers covered in the refrigerator up to 5 days or in the freezer up to 1 month. *If avoiding oil, you can try subbing a 1/2 + 1/2 mixture of applesauce and water for the oil. Or you can use more dates and a little water to avoid the oil. But I haven't tested these methods and can’t guarantee the results. *In place of the date caramel, for even more decadent bars sub a batch of our Easy Vegan Caramel Sauce. *Nutrition information is a rough estimate for 1 of 24 bars calculated with the oil (I cut them into 9 bars for photos, but they’re quite rich and we would recommend smaller servings). Hi, This looks delicious, is there anyway I can add flaxseed into this as I want the family to have more omega 3 in the diet. Maybe in the crust? I was excited to make these for Christmas. Unfortunately they didn’t work out. I couldn’t get the coconut to become coconut butter despite 10 minutes of processing in my Kitchenaid food processor. The peanut butter was difficult to spread over the pecans and after baking they wouldn’t stay together. Would this work with store bought coconut butter/manna? Oh my goodness! Dana, this is simply delicious and SO GOOD! All of my non-vegan friends are raving about it. I have made it twice and will definitely be making it again. Thank you for the wonderful recipe and love your blog! Hi! I an confused about the coconut butter/coconut flake part. How much coconut butter are we supposed to use? Ok, I see a previous answer to this question. How do you process into coconut butter? Just using a food processor? What can I use instead of almond? Thanks! Hi Danny! I’d say walnuts or pecans! These were amazing. Well worth the steps involved. These are amazing!!!!! I’ve made them 3 times and they are perfect every time! They are such a crowd pleaser! I’ve switched up the nuts depending on what I have on hand and used almond butter instead of peanut butter! Hi Pamela! Process 2 1/2 cups (175 g) into coconut butter, while keeping 1/2 cup (35 g) set aside for the topping) Hope this helps! My new fave dessert! So yummy, sweet-tooth-satisfying and healthy that i feel happy after eating it. I added pumpkin seeds as well and still turned out yummy! Thanks for sharing this! So far, all the desserts i’ve made from your recipes are delicious, and i feel good that they have healthier twists in them! Thanks so much! This is very delicious. One of my roommates who doesn’t like desserts or coconut loved it and got seconds! ^.^ He said he likes how it didn’t have added sugar and was not too too sweet. I have a question: How do you make the coconut creamy? I processed it in my food processor for a long time (3+ minutes) and it just turned into a powdery texture, no creaminess. Should I have combined it with something? Was I supposed to mix it with coconut butter or should it turn into coconut butter? Hi Vee! We are glad that you and your roommate enjoyed the bars! Regarding your coconut butter, the only thing I can think it would be is the equipment you’re using. The coconut should go through three stages on its way to turning into butter. First the texture will be finely shredded, then thin out into a grainy liquid, then finally turn into a smooth, thick liquid. The finished butter will seem runny, but when you taste it the texture will be like thick, sticky, slightly grainy peanut butter. We highly recommend this food processor as we have had the most success with it! I would LOVE to make and try this recipe, but what can you recommend to replace the dates with? FYI. I am trying out your Lentil mushroom stew over mashed potatoes tomorrow night! I have been Vegan for almost 10 years, the only one in my family. I have invited a few family members over to try it out with me. Thank you for having this channel. Thanks Christina! The dates in this recipe can be subbed with this caramel, just leave out the dates! And just add 1-2 Tbsp more maple syrup in the crust in place of the 2 dates there. Good luck! To avoid excess dishes and unnecessary cleanings of the food processor, I made the base “dough” first, substituting an extra two Medjool dates for the two tablespoons of maple syrup. While that baked, I chopped the pecans in the uncleaned processor and set them aside in a bowl, then prepared the coconut butter and set that aside too. After the coconut butter I blended the date paste together, which I spread right from the processor once the base was set. I accidentally used much less coconut flake quantity than called for (3/4 pureed and 1/4 left whole), but this mistake did not take away from the end product. I found the peanut butter a little hard to spread over the chopped pecans, so I ended up just mixing them together and making a crunchy peanut butter layer. After sprinkling the coconut flakes on top, I chopped some Trader Joe’s dark chocolate in the then-clear food processor and distributed that over the flakes. In the future, I think I’ll melt the chocolate instead of chopping it. After the bars baked and I cut them into pieces (I yielded 16 squares), the chocolate just rolled off. 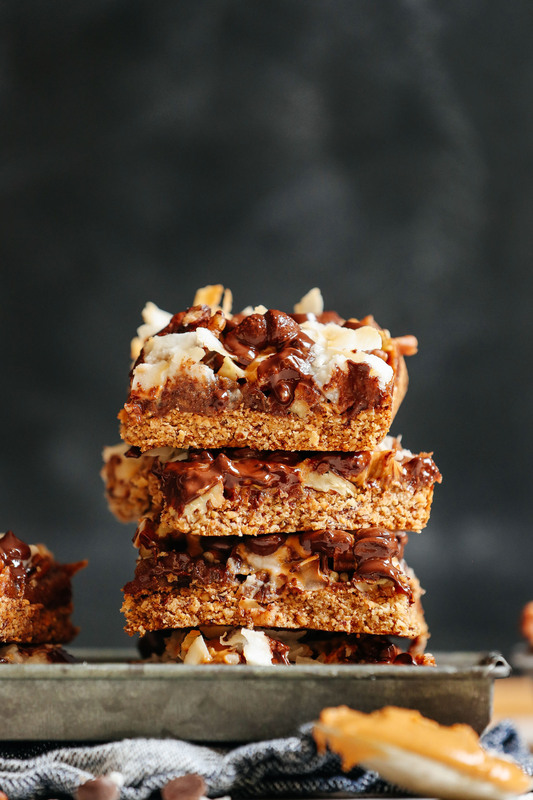 Altogether, though, these bars fulfilled all of the expectations I had for a healthy “indulgence” – easy, texturally interesting, and made with whole foods. Thanks, Dana! Loved this! But the coconut butter recipe didn’t work for me. I have a very efficient food processor and blended it for 30 minutes before giving up. I ended up adding the coconut to the peanut butter and added some water so that I could spread the mixture. 1. How did you get your peanut butter to drizzle consistency? I’ve never seen peanut butter like that and was very difficult to spread mine evenly on top of the soft date caramel. 2. You say in the recipe to use 3 cups coconut flakes divided. However in the video you use shredded coconut to blend – does this make a difference? I blended flaked coconuts for EVER and no coconut butter, all that happened was tiny hard flakes. I made the recipe and the flavours were delicious however the texture of the tiny coconut flakes were unpleasant and I want to know how to make coconut butter. Hi Kara! Thanks for reaching out. 1. The consistency of peanut butter can vary depending on whether you’re using a natural pb with no thickeners. If you are having a tricky time spreading it, you can warm it up slightly at that should help? 2. Check the coconut butter page for tips! We share the food processor that we highly recommend as well as cover FAQs. What would you recommend as a substitute for the almonds in the crust? I can easily leave out the walnuts but the almond clearly makes the crust. My hubby is allergic to nuts and I would like to share this yummy treat with him. Thank you! omg i’ve missed these SO much. genius. thank yoU!! I don’t usually comment on threads but this recipe was sooooo good. I didnt use the proper kitchen equipment so my coconut “butter” was more like coconut crumbles and the dates were like a date paste. But this was a winner. My husband has been plant based for 6 days now. So I showed him how great plant based could be. This is a treat and I wont make them too often as we have very little self control haha. These are a winner and were eaten in one day, ugh!! We’re so glad to hear this, Kerri! Thanks for sharing! Yaaassss!!! These look amazing! All the layers, all the days. Made this in a pinch. Super easy. Another winner! I made these for a potluck and they were devoured. Thanks again for your consistently terrific recipes!! I made the vegan bars last night and they are scrumptious!!! Woot woot! We’re glad you enjoyed them, Shelly! These turned out delicious! I especially liked the crust. My only tip would be if your peanut butter is a little too thick, whisk with some warm water so it will drizzle more easily! So good. Amazing flavor and so decadent tasting. I made it almost exactly as written, although I subbed the maple syrup for a few extra dates +water in the crust, and used unsweetened carob chips to make it completely refined sugar free. I tried making the coconut butter in my ninja blender and it failed, and I moved it to the food processor and it worked right away. I heated up my peanut butter before spreading which made it a lot easier. Thanks for the great recipe! What a great recipe! 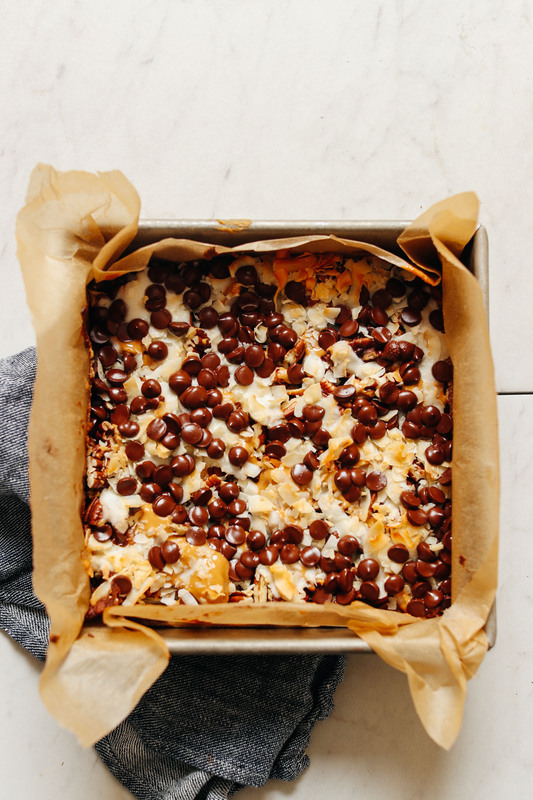 So much better than regular layer bars since they’re so healthy and full of all-natural ingredients. I made them tonight for a work party and they got eaten up so quickly. The date caramel was my favorite layer…great texture and nice kick of sweetness. I layered the peanut butter on top of the date caramel, then added the pecans, because I thought it might be hard to spread the PB on top of the chopped nuts. They were very crumbly and messy but that’s part of the fun. Thanks for this keeper recipe, Dana! So so so so YUMMY! I made these last night and have nearly eaten the whole batch myself! I used less of the coconut butter as I only have a little of my homemade batch left but they are still super delicious! Thanks for the fabulous recipe! After 20 min in a brand new kitchenaid food processor, my coconut will not butter. At this point, I’m adding coconut oil and coconut creamer in drizzles to try and coax it forward. So strange! What size bowl does your processor have? Perhaps it’s too large? Did you add enough coconut flakes to get the mixture going? Perhaps it’s the FP model? It was a standard sized bowl, but it has a mini bowl insert. Perhaps next time I can try using that. The recipe turned out great, but the coconut puree shred was a bit messy and sand like. Hello Dana! Didn’t know how else to hey ahold of you but I wanted to ask you if their is any chance of you or ‘Minimalist Baker’ getting an app available? I think it would be such a hit and so many people would looove it! Thanks for the kind words, Drew! It is not something we’re currently working on but we appreciate the support! I love the date layer specially as i never add salt in date recipes. this recipe looks super fudgy, chewy, moist and melt in mouth. I am damn sure that mr.husband will definitely love this. Ya it is the food processor that I’m using. The supra kitchen system came with blender , processor and nutri ninja cups . Expensive machine 1200 Watts . This coconut butter is the only thing its failed on ☹ I’m thinking its the blade alignment . Maybe I can find different blade for it . I’ve had hit and miss experiences with Ninja’s. They don’t seem to want to blend things super fine (like hummus or dates, for instance). Do you have a food processor by chance? That’s best for coconut butter! So I made these with no adjustments (and it took about 2 hours, mostly because homemade coconut butter is a persnickety thing and not all equipment is created equal but a WHOLE BAG of Bob’s Unsweetened Coconut Flakes + Vitamix with pluger was finally the key), and because I’ve been following a nutritarian diet (oil free, no added sugar or salt), these were SO rich and sweet to me that i basically fell off the wagon for a couple days, and when I popped my head back up, they were all gone WHOOPS WHAT WAS I THINKING. I’m no quitter, so I’m now interested in scaling back to an oil-free crust and cocoa nibs version, and also maybe somehow diluting the coconut butter, or making sure it’s very warm and can be applied in skinny little drizzles, or at least mixing it with either the date caramel or the PB in order to keep it softer. My coconut butter blobs stayed hard and squished the layers below with each bite (it’s not coconut oil melting point weather her in Seattle just yet). If you’re reading this and you’ve had success with an oil-free crust or thinner/softer/more dilute coconut butter or sell safety nets for wagons, please let me know and THANKS. I don’t know about wagon safety nets, but I did have success just using three tablespoons of water in place of the coconut oil. As for the coconut butter, I didn’t actually blend the coconut flakes for the full ten minutes recommended to achieve a “butter” consistency because there was a baby in the house trying to rest and it would have been inconsiderate to run the machine that long. Basically, I let the machine cut the flakes into really small pieces that I scattered over the peanut butter layer, then added the bigger, full coconut flakes. I didn’t have a problem with the coconut layer squishing the others. I hope this helps, Hannah! I’m allergic to almonds. Would another nut work in place of the almonds in the crust? Would pecans, walnuts or cashews work instead? I’d say walnuts or pecans! I can imagine how addictive this may be! I would probably eat all of the bars in one sitting, so there’s no point in cutting up nine or twenty four bars! I can take any rich delicious dessert any day! I can confirm their addictive qualities when made as written. Hey, Would there be any alternative to oats that would work in this? I just can’t seem to get myself to like them! Hmm, oats are kind of key in this recipe, as almonds alone can be a little crumbly on their own. I’d probably recommend some sort of buckwheat flour (untoasted) or shredded coconut in their place. Hope this helps! if using prepared coconut butter, how much should i use? Instead of grinding almonds, could I use almond meal or flour? So yes, but the measurements will be a little different. Let us know what amounts you come up with! This sounds delicious! The crust is so simple, but looks so tasty! I’m definitely going to give this a try. OMG these look so tasty and I love anything with dates in them! We hope you love the recipe, Maria! Can i make this recipe raw? I would rather not bake all this good ingeredients, would it work? Really good and I enjoyed all the different components that I learned to make. I feel like I can use the crust, caramel, and the coconut butter all in other ways. Thanks so much Dana . OMGGGG these look AMAZING. Def on my to-bake list! I too remember 7 layer bars, and the coconut component was always my favorite. Well done, Dana! With what can I replace the coconut? Any idea with what to replave ut with Nikki??? Hmm, I’d say coconut butter is pretty central in this recipe. Otherwise, maybe double up on peanut butter and date caramel and add way more chocolate chips! Hmm, oats are kind of key in this recipe, as almonds alone can be a little crumbly on their own. I’d probably recommend some sort of buckwheat flour (untoasted) or shredded coconut in their place. Can’t wait to try these!! Yum! So I saw you post this on Instagram and I decided I had to have it, immediately. So I ran to the store, got the few ingredients I was missing, and headed home to make these. I just finished eating my first one, and I can say that they are just as delicious as they look in the photo. Thank you so much for sharing! Looks Great Dana!! Can’t wait to make these! Yum!! I’ve been on an anti-inflammation diet for over a month-getting bored with it, and here you come on a lazy Saturday morning with this recipe loaded with anti-inflammatory ingredients! I couldn’t get to the kitchen fast enough-these are amazing! You guys are my heroes! Yay! thanks for sharing, Sandra! I don’t want to make it; I just want to eat this. The past few recipes are comfort food and sinful. Thank you for this. 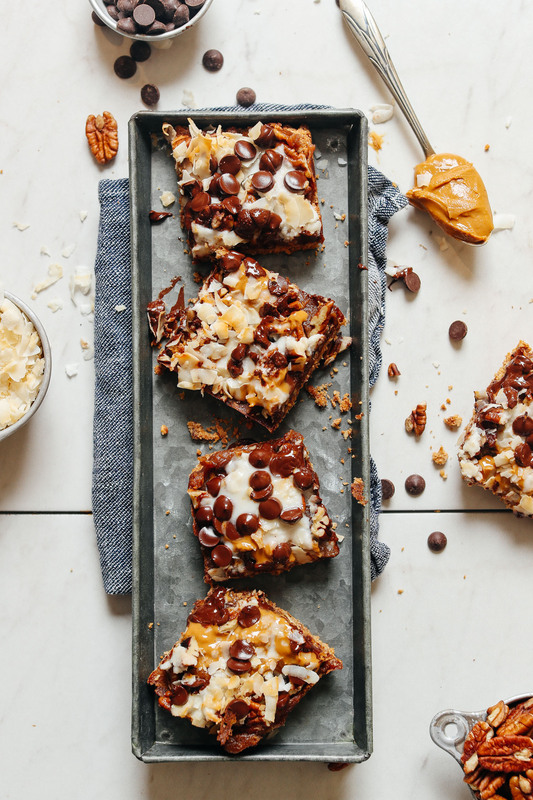 I have always LOVED 7 layer bars!! So excited to try these. 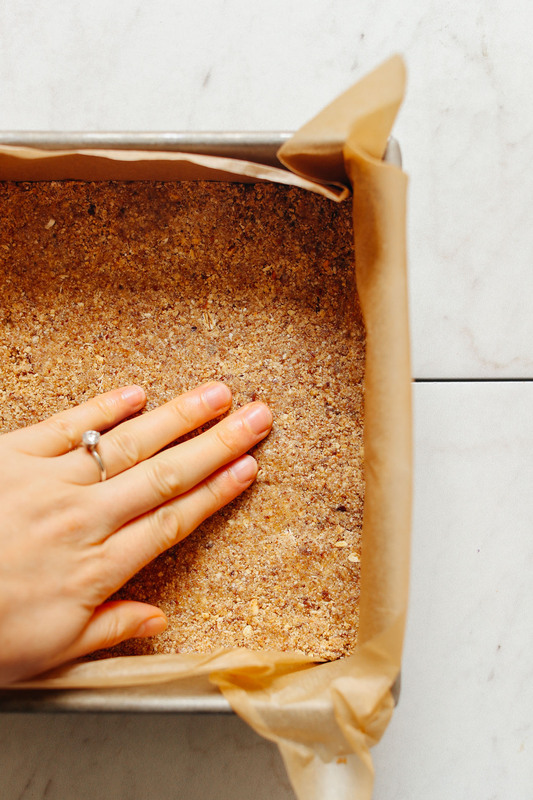 I wonder if I could use the leftover almond pulp from making almond milk in the crust, instead of whole almonds? I guess I would need a little something more to bind together. I’m always trying to find ways to use my pulp ? I always throw my pulp into my smoothies! I freeze it until I need to use it. Have u tried to make an unrefined sugar almond paste with ur pulp? I think it could work!